You built a website with SiteW and you want it to appear in the first results of Google? Just follow these simple steps and you will greatly improve your website SEO. SEO (Search Engine Optimization) is the process of improving the volume and quality of traffic to a website from search engines via search results for targeted keywords. We explain in this tutorial what you need to do in order to improve your search engine rankings. The goal of search engines is to offer a list of websites that fit in the most relevant way possible the question asked by the internet user. Actually, the notion of relevance is not easy to define and search engines use a series of measures and parameters (like for instance the number of keywords, the number of links, the frequency of updates) that algorithms interpret to give this result. To this end, your website is regularly visited by robots. Updating a website requires a period of time ranging from a few hours to several weeks, before it is taken into account in the search engine results. Part of SEO consists of optimizing the parameters used by search engines in order to improve the relevance of a web page. Search engines are constantly evolving to counter these techniques, if they prevent them from giving relevant answers to the internet-users’ questions. Therefore, to achieve a good organic SEO strategy, you must begin to answer in the best way possible to the internet-users’ questions. For it is what will be enhanced in the long term, regardless of the evolution of search engines. The first question you need to answer is: "What are the keywords by which you want your website to be displayed on Google?" If you want to create a website about SEO, you probably want your website to appear for the search terms "Search engine optimization" or "Search engine first results". Do not pick too many keywords, 6 maximum. Now, what you need to do is to convince search engines that your website is the one which talks the best about these words. If you need some help by choosing your keywords, you can read our guide: How to use keywords for Search Engine Optimization? The title, description and page url are generally displayed in the search engine results. They allow on one hand to improve your website ranking and on the other hand to incite people to visit your web page (the internet-users read the titles and descriptions in the serp (search engine results pages) and click on the most interesting/relevant links). On the page My-websites, click on the button Settings, then, Search engines. Change the title to be short and to include your keywords. Update the description: it must contain all the keywords you chose. Try to write attractively to make people click on your links. 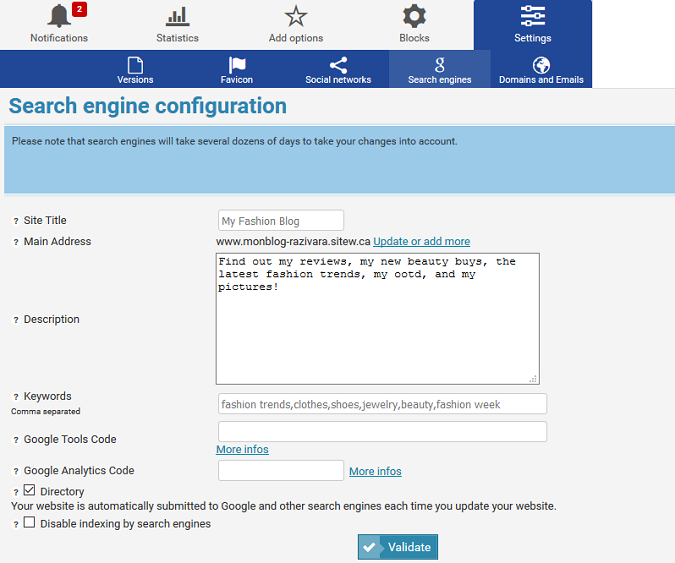 Then, although it is not used anymore by search engines, modify the keyword list with your keywords. It is really important to choose names which contain your keywords. For example, update the page named 'welcome' to 'SEO principles' or a page named ‘Tools’ to ‘SEO tools’. 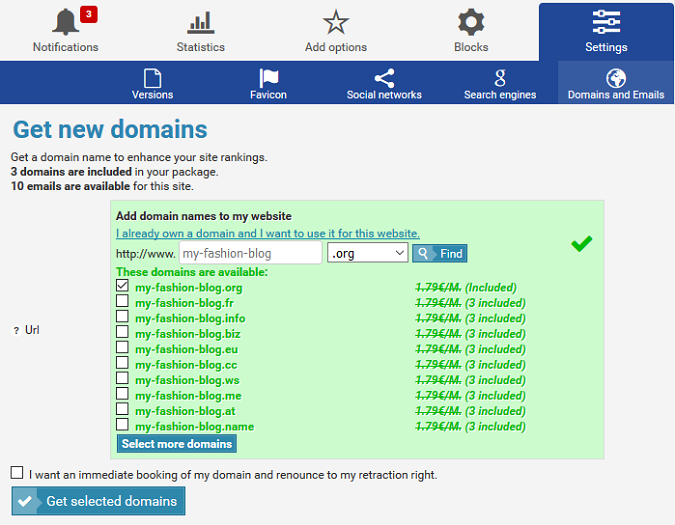 Also remember that with SiteW, you can customize your page urls. In the website modification tool, select your page in the orange area on the left of your screen, click on ☰ then, on SEO in the bottom toolbar. You can then define your own url by filling in the appropriate field. It is an easy and effective way to add even more keywords to your website and to improve your SEO. Booking a domain name is an essential step for your SEO strategy, because it allows you to customize your website url and to show Google that you own a professional website, for you have to pay to book a domain. It is easy to register a domain with SiteW: you can do it for free with our Premium or Pro packages and for only 2.39€TTC/month for the Starter package. 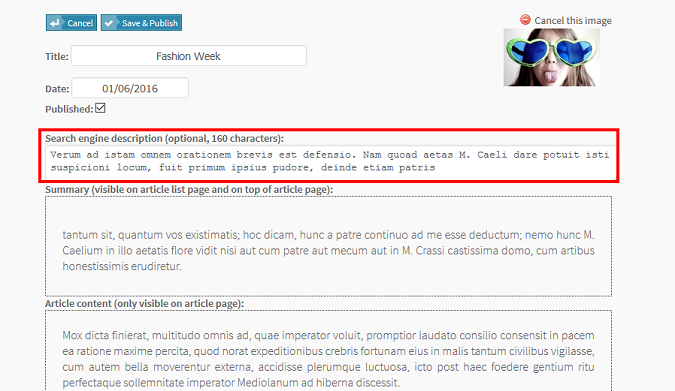 You need to insert Text blocks in all your pages, containing your keywords as often as possible. Totally empty pages or pages only containing images or videos will be poorly indexed. That's why we recommend that you comment on your photos and videos if your page does not contain any text. Expression words should appear together, but also split. For example, Website search engine optimization should appear, as well as sentences containing website, SEO and Search engines. It is useful to alternate between words of the vocabulary of website SEO. You may think that the content is a bit repetitive (the word 'SEO' can be repeated every 100 words). But this will help Google to understand what your website is about and thus to improve your keyword rankings. You should not have overloaded pages. Split big pages into smaller ones. The more pages your site contains, the better search engines consider it, because it will be more likely to match different search terms. With SiteW Premium and Pro packages, you can create an unlimited number of pages. Search engines attach a lot of importance to the number and to the quality of links pointing to your website (backlinks). It is very important to have as many backlinks as possible, and these links must contain your keywords and be found in quality websites. For our SEO Website example, a link like 'Website about SEO' will be better than 'Visit this website' or a simple web address. Nevertheless remember not to use too many links, because it can be considered as unnatural by search engines. The context is important: the page which contains your link must also contain your keywords. The link will be more attractive for the people visiting the website and search engines will consider that the link has a better quality. Ask other webmasters to exchange links with you. You can, for example, add a link on your website for a blog specialized in SEO and the other website will add a link to yours. On google, look for blogs and bulletin boards which talk or talked about the subject of your website, and post a comment with a link to your website. Generally, in order to avoid spamming, the links in blogs and forums are nofollow, that is to say that they are not taken into account by search engines. Nevertheless, these links allow you to get visitors. For example, by typing 'SEO forum' or 'Blog about search engines’, you will find websites on which it would be interesting to post a message with a link to your website. You can also contact specialized websites or blogs and ask them to write an article about you and your website. For the websites created with SiteW, we created several tools to improve your Search Engine Optimization. When you create a website, we automatically ask the most important search engines to visit it. All the SiteW websites have special hidden pages for search engines: robots.txt and sitemap.xml that list the pages of your website. Optimization of the source code: tags (titles, subtitles) according to the content. If you modify your website, we warn the largest search engines that your website changed and send them the new page list to update their index. 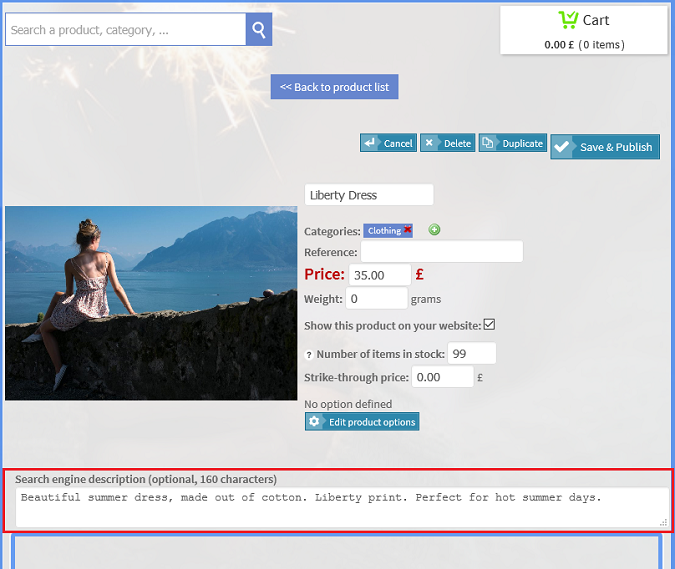 SiteW offers you the possibility to add descriptions especially meant for search engines, to customize meta-descriptions of your blog pages, the product descriptions and the product categories of your online store, in order to optimize the ranking of your blog articles and of your online shop. 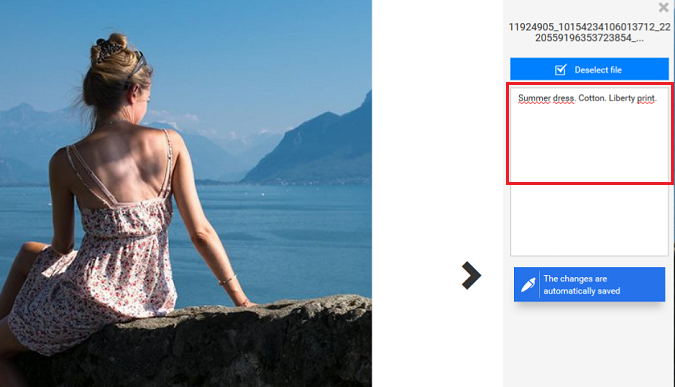 With SiteW, you can also add Alt-tags to your images, to improve their ranking on Google Images. As far as your stats are concerned, SiteW allows you to directly access your website stats by going to the My websites page. You can also simply refer directly to Google Analytics statistics and use this data to improve your website SEO. You now know all the solutions SiteW offers you, to improve your Google ranking. Don’t hesitate to read our FAQ, if you have precise questions concerning your website SEO.